UPDATE 2016-12-31: Removed dead link to maplib. UPDATE 2013-09-23: New, much larger version – see below! Here’s version 2 (September 2013). You can print this at 16.5″x10.75″ at 300dpi. Have an ordinary printer? Check out PosteRazor! You can find the image on Imgur and Flickr too. 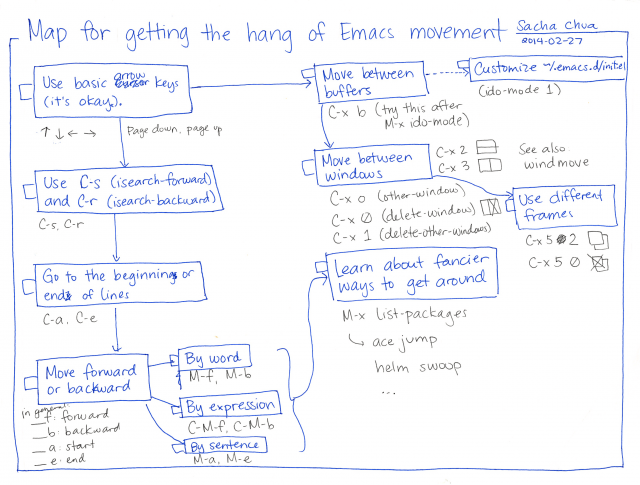 If you’re completely new to Emacs, start with these Emacs beginner resources. If you’re comfortable with Emacs and you want to learn Emacs Lisp, check out my Read Lisp, Tweak Emacs series. 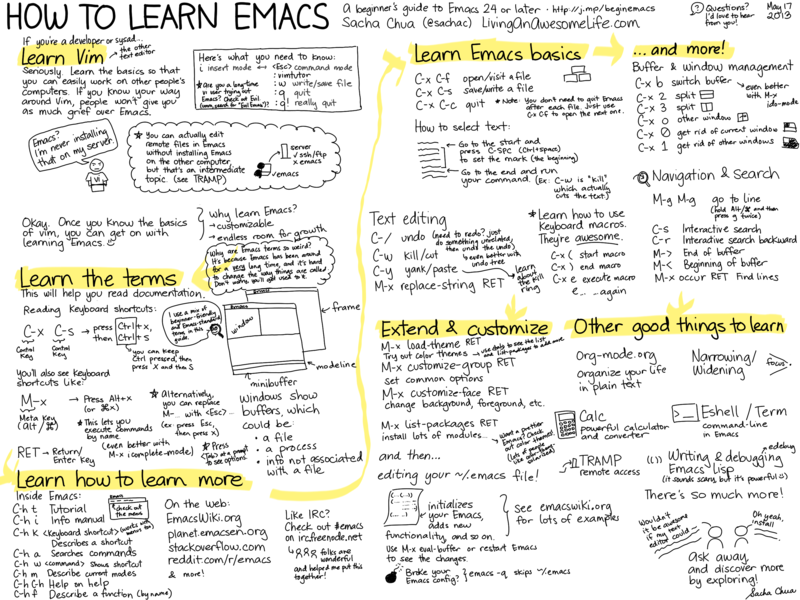 For more Emacs inspiration, check out Planet Emacsen. Feel free to share, reuse, or modify this under the Creative Commons Attribution Licence. Enjoy! Possibly counterintuitive point: if you’re a developer or system administrator, t’s good to learn at least the basics of Vim. Despite the perception of a “Emacs vs. Vi” holy war (one of the classic battles in computer science), it makes sense to know both editors especially if you work with people who use Vi a lot. 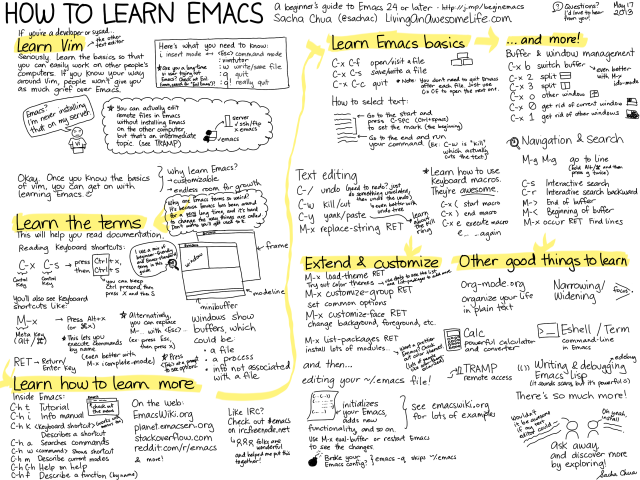 Know enough Vi to find your way around, and then learn how to customize Emacs to fit you to a tee. 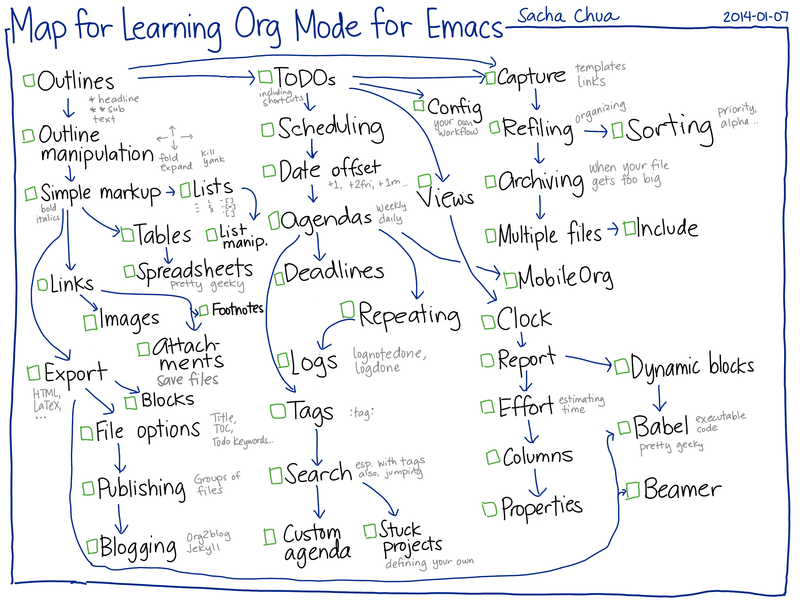 That way, you’ll avoid the pressure of not being able to work well with your team or your infrastructure, and you’ll have the space to explore Emacs. 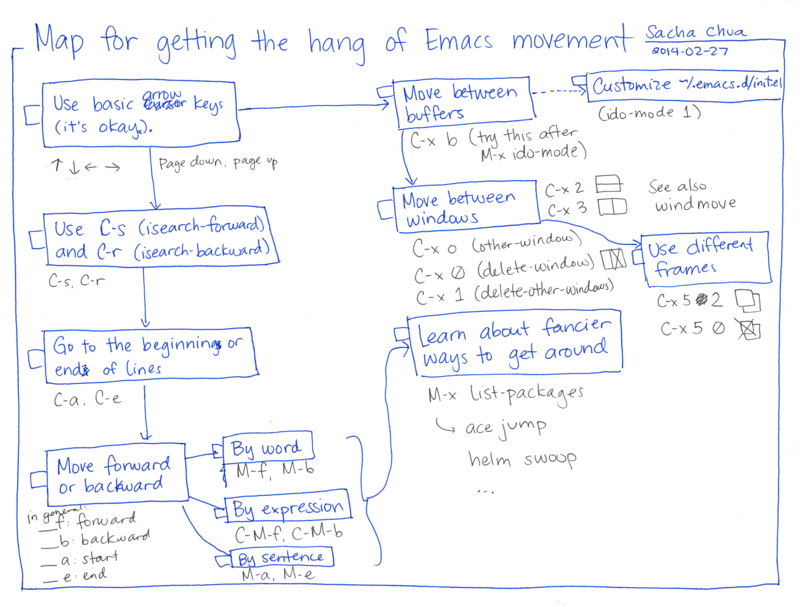 =) Emacs is totally awesome. Meta discussion: How can I make this even better? What else would you like me to draw a guide for? I’d love to hear your thoughts! Also, thanks to dash, nicferrier, fledermaus, ijp, hypnocat, Fuco, macrobat, taylanub, axrfnu, Sebboh, thorkill, jave_, jrm, and the rest of #emacs for suggestions and feedback! Update 2013-05-18: Check out the conversations on Hacker News and Reddit! 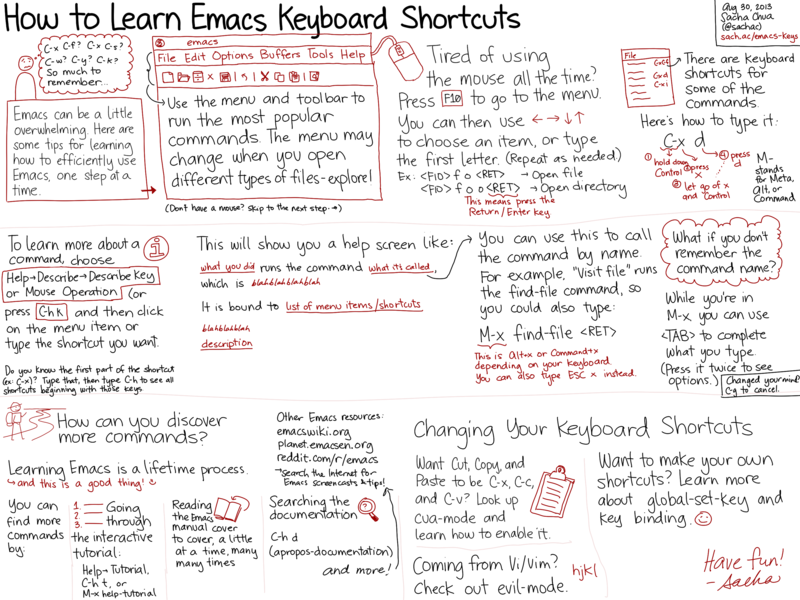 Emacs keyboard shortcuts often mystify beginners because they’re not the same as the shortcuts for other applications (C-w instead of C-x for cutting text, etc. ), and they’re long (what do you mean, C-x 5 f?!). I hope this guide will help break down the learning process for you so that you can pick up the keyboard shortcuts step by step. It’s under the Creative Commons Attribution License, so feel free to share! Click on the image to view or save a larger version. It should print out fine on 8.5×11 paper in landscape mode, and you might even be able to go up to 11×17. 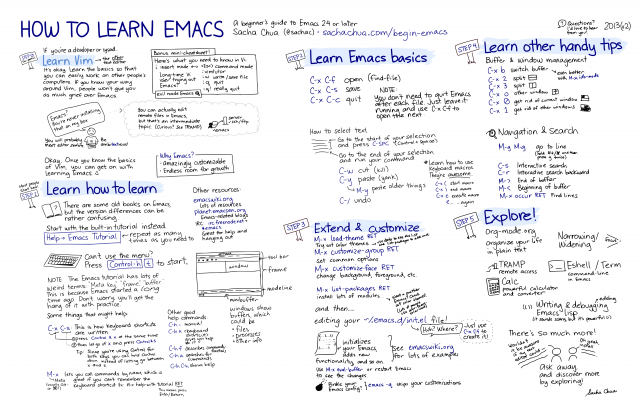 If you like this, you might also like the similar hand-drawn one-page guide I made on How to Learn Emacs, or my other Emacs-related posts. Enjoy! For your convenience, you can find this page at http://sach.ac/emacs-keys. When I learn something new, I always find myself wishing there was some kind of map to help me figure out where to start, how to track progress, and what to learn next. So now I’m making them. 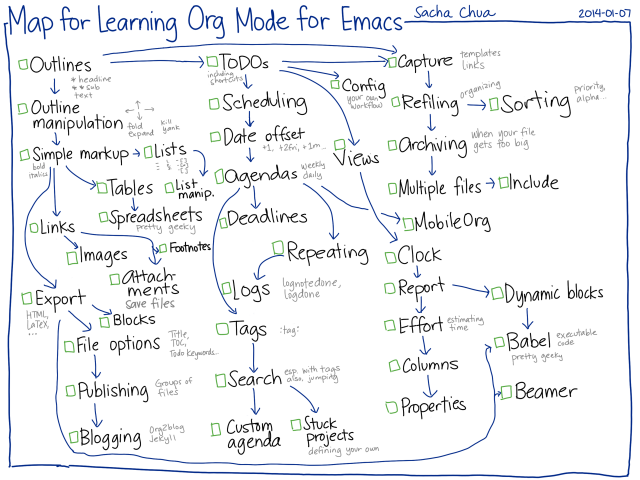 Here’s one for learning Org Mode, a popular outline/TODO/everything-else mode for the Emacs text editor. You can probably figure out the relevant manual sections to read based on the keywords, but feel free to ask in the comments if you need more help. 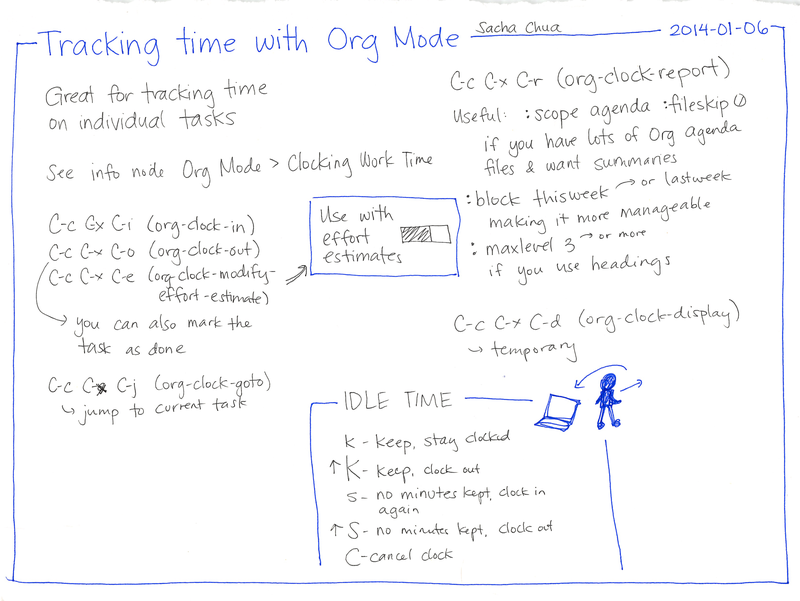 And here’s the one-page cheat sheet I made before helping someone dig into tracking time with Org. 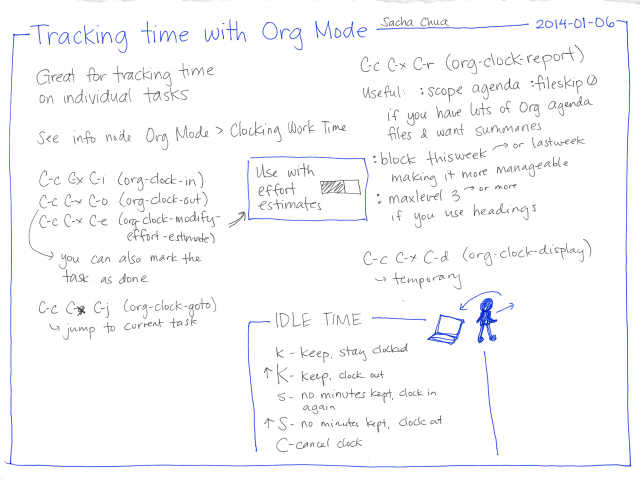 It’s a great way to measure your time on specific tasks. Dired is the Emacs directory editor. You can get to it with C-x C-f (find-file) if you specify a directory. C-x d (dired) works too. 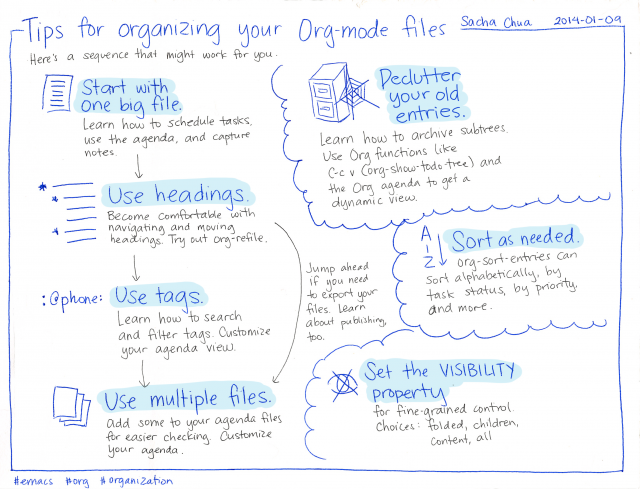 Dired makes it easy to do batch operations on files. One of the niftiest features that you might not even think of looking for, though, is the ability to make a Dired buffer editable using C-x C-q (dired-toggle-read-only). 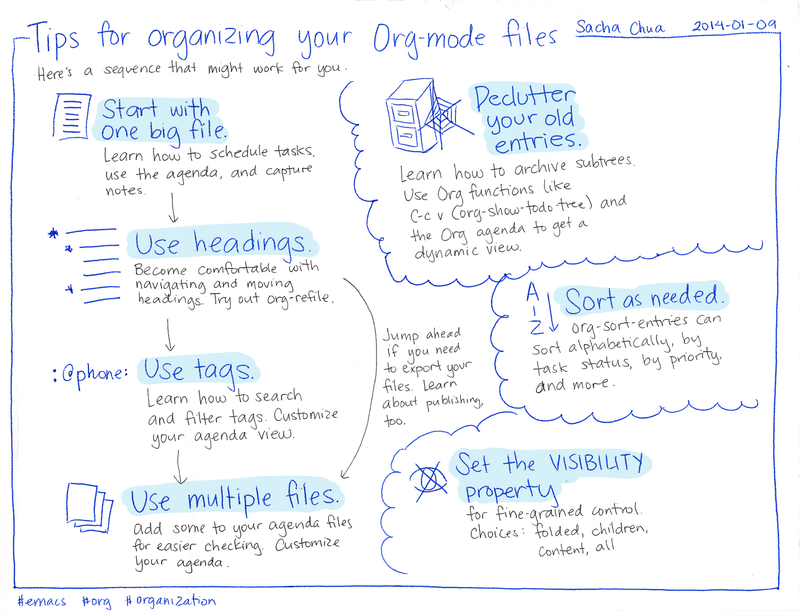 Then you can use replace-regexp, keyboard macros, and all sorts of other ways to change filenames. When you switch back out of editing mode with C-x C-q, the files will be updated. 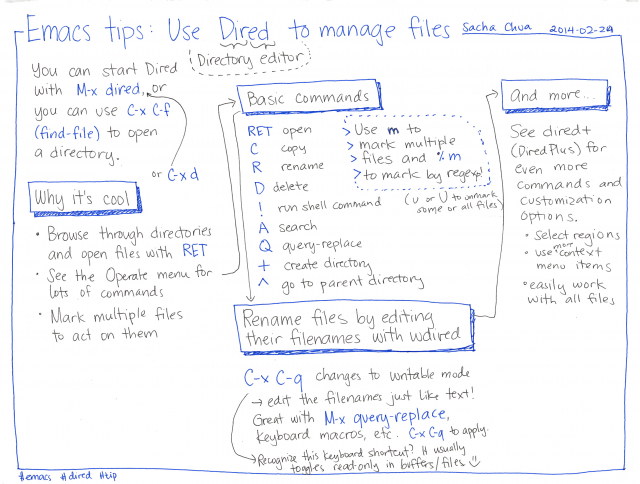 Here’s a cheat sheet for working with Dired. Also, bjonnh suggested making a cheat sheet for movement commands. 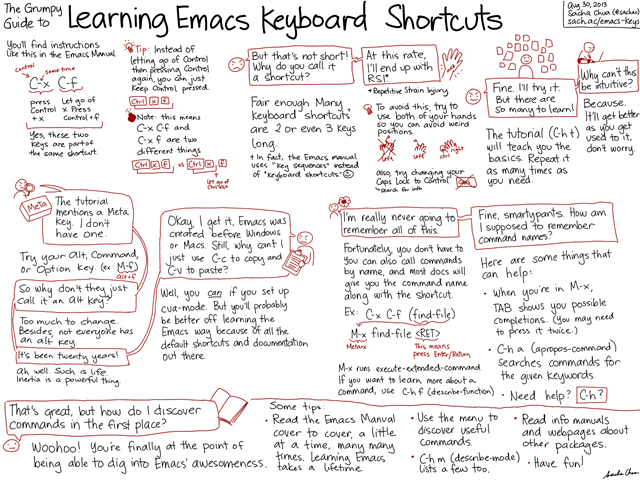 I use the M-b, M-f, C-M-b, and C-M-f shortcuts a lot when working with Emacs Lisp. C-a and C-e are great too. If you use evil-mode because you’re used to Vim shortcuts, this cheat sheet won’t be useful to you, but maybe I can make an evil-mode cheat sheet someday. In other news, I’m slowly becoming the kind of person who can understand SmartParens. I’m getting the hang of slurp and barf, but the rest of it still boggles me. Someday!